To those preparing for the Final Advent of our Lord, My family and I feel very blessed to be among so many wonderful people. You have been very generous and kind to us. Thank you for your hospitality and the opportunity to serve you. I knew preaching and teaching Godâ€™s Word would be enjoyable, but it is made all the more enjoyable when people are appreciative and understand the value of it in their daily lives. When I first came to Concordia and Bethany, I understood that there was a desire for more opportunities to study Godâ€™s Word. This is a desire that is truly pleasing to God and can only come from His work in your hearts. This is also a blessing for Pastor and me since this is the very reason that we are among you â€“ to teach and preach Godâ€™s Word to His people. In this Advent season, we key in on the truth of Jesusâ€™ coming. At Christmas time, we celebrate His first coming to this earth, being born of the Virgin Mary so that as both God and Man, He could live perfectly for us and take away our eternal punishment. But this first coming would mean nothing to us if He did not come into our hearts. This gracious coming happens only through His Word (the Bible) and Sacraments (Holy Baptism and Holy Communion). In His Word, God tells us that Jesus will come again on finally on Judgment Day. Jesus gracious coming to us is essential for both benefitting from His first coming and preparing for His final coming. This gracious coming is why we Christians continually desire to come together around the Means of Grace â€“ Word and Sacrament. In the 3rd Commandment, God reminds us that the day of rest, was for both the body and the soul. Jesus is your Sabbath rest. â€œCome unto Me ye wearyâ€¦and I will give you rest.â€ (Matt. 11:28) So I invite you to come and rest in your Savior. There are many opportunities happening every week. 1:15 PM â€“ Confessing Jesus * Going through the Confessions of the Lutheran Church: the Book of Concord â€“ currently studying Lutherâ€™s â€œlast will and testamentâ€: the Smalcald Articles. Saturday 7:00 â€“ Private Absolution * This is a good time for examination and preparation for Communion. 1:15 PM â€“ Confessing Jesus (Through Skype) * Going through the Confessions of the Lutheran Church: the Book of Concord â€“ currently studying Lutherâ€™s â€œlast will and testamentâ€: the Smalcald Articles. 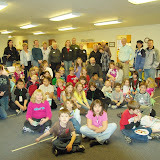 Here are some photos from our Jr. Members hike at the end of October.